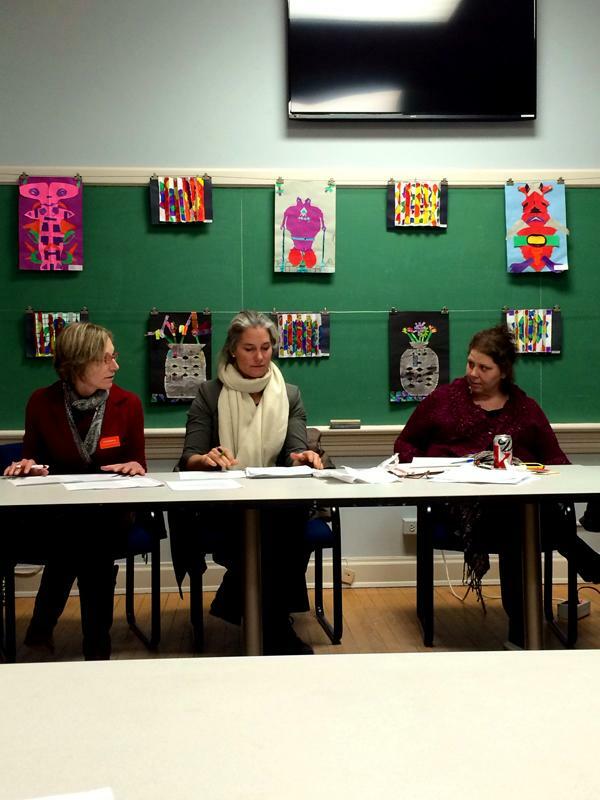 Cultural arts coordinator Jennifer Lasik (right) and the Evanston Arts Council co-chairs lead a council meeting in 2014. The council recently opened applications for pop-up exhibits to be displayed in the summer. The Evanston Arts Council opened applications for local artists to create “pop-up” exhibits for display throughout Evanston during the summer. According to a Tuesday news release, the council is looking for temporary art projects focused on “community values.” Though it will consider uncompleted proposals with a timeline, the release said the council prefers completed work. The council will provide three grants of up to $1,000 per artist for materials and other exhibit-related costs. In the release, the council outlined criteria that will be used by a committee to evaluate proposals: creativity, innovation, diversity, accessibility, equity, planning and public benefit. The release instructed artists to include a narrative explaining the project, a budget, a plan to execute the project as well as pictures, descriptions or renderings of the visual. The release also emphasized that artists should describe the public benefit of the project, specifically how it serves historically marginalized populations in the community. According to the release, artists can suggest a location, but the arts council and city officials will determine the final placement based on public access, safety and other scheduled activities. City staff will also help schedule and promote the events and exhibits. The release suggested both performances and visual art pieces as possibilities. For performance pieces, it specified applicants should include weather precautions and safety guidelines. The Evanston Arts Council started a similar program to decorate community spaces two years ago. Jennifer Lasik, cultural arts coordinator for the city, said she launched the program in 2016 after noticing public spaces needed art on walls. The application closes May 15, and notifications will go out June 1 before projects go on display between June 10 and Aug. 31.